Nice bone finds Bow! I have a couple of pieces from Lavernock that i'm trying to identify, namely the ammonites. 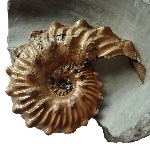 Does anybody know what the most common species of Ammonite from Lavernock is? They are preserved in calcite, but frequently incomplete or blown calcite. I picked this up at Lavernock on Thursday 21st April. It was buried in the sand on a small island that forms at low tide. I thought it was a bit of plesiosaur rib and you can just see the small bit of bone sticking out below the 2p. In the process of finding it, I managed to fall in the sea. The tide had started coming back in before I could wade back across the small channel and I felt pretty foolish, especially as my son thought it was hilarious and there was someone else there with a UKGE badge on. But now I dead chuffed as I've done a bit of exploratory prep and it turns out it's a line of 8 verts plus two broken ones at either end and some still have neurals attached. Although it must have been a pretty small ichthyosaur as vert diameters are approximately the size of a 1p. Photo isn't too good but I'll repost when it's finished. That looks like a great find, i've never found any articulated stuff like that before! looking forward to the other pics when its done. Sorry Joe, I can't help I know absolutely nothing about ammonites. Superb Find Nick, very jealous! Not to worry Bow, but thanks anyway. After a little research I managed to find out a little bit of information, that may be of use for some people. It appears that the most common Ammonite from Lavernock is infact the species of Psiloceras planorbis - didn't they know they could be found there! Source: Here. It also appears that there is another unknown species of ammonite to be found, more research to be done on my part now! You're right in that one of the ammonites found at Lavernock/St Marys Well are indeed Psiloceras Planorbis. The other one is Caloceras Johnstoni. The Caloceras Johnstoni are the same species as the irridescent colored ones from Somerset that you see for sale on ebay. Unfortunately, the ones from South Wales are no way near as pretty as the Somerset ones. In fact the ammonites at Lavernock tend to be imprints, impressions or just partial bits. I've tried to prep quite a few over the years and I've never had a good one but someone else may have. You also get nautili (if that's the plural) but again they tend to be poor quality and very difficult, if not impossible to extract successfully. I posted one a while ago which I'm working on prepping but it'll probably just end up being polished once I've removed all the calcite lumps and bumps. There is a good book called "Walking the Rocks" which'll give you some geological detail. It's by Steve Howe (who used to work at the Cardiff Museum and may still do) I think, but I can't find my copy to check. to get hold of a copy of that book. Hi Nick... you did leave it a bit late in wading back over but it looks like it was worth it,it did look like rib when you showed it to me,well found! Joe ...the Planorbis beds are usualy the squashed brown imprints from the beach layers and the Caloceras tend to come from blocks in the cliff but the centers are usualy squashed flat and impossible to get out,i've only just picked up my second good ammonite from there in 20 years, a small pyrite 1p sized was my first and the new one still buried in matrix at the moment. Nick,nice tight verts - good find . Steve,you would do well here on the Yorkshire coast,i must lose about 200nr 7oz leads each year . Also Paddy cleaned up a little area on my Ichthy rostrum and some nice teeth came up. I did the rest of the prep. Some other bits with bone, showing, hopefully more bone to be uncovered. Hi Bow nice pieces,2nd pic from bottom..those planorbis beds can be a pain to prep ,hope you get lucky and get a soft piece. Steve, the Planorbis bed with the Ammonites was really soft, but the bone just turned out to be scrap. Well done, are they quite rare from the area? The lobster part was the first one that the museum knows about, same goes for the Brittlestar I found a few weeks back. Lastly, i'm guessing this is Ichthy skull, probably from around the eye socket? Nice pieces,it didn't come out too bad. Lovely stuff, im really rather jealous of you're location lol. That last piece reminds me of fish bone, but you're probably right with it. Well done Bow, you've got some nice finds there. I was down in South Wales over the weekend, taking the kids to see Wales v Barbarians. I popped to Lavernock on Friday and found a rolled plesiosaur vert with neural arch and half an ichthyosaur vert embedded in bone bed. I also found a land plant and put it down on a rock with my hammer and chiesel and went to look for some other stuff. When I returned I couldn't find either the tools or the fossil. I searched until the tide came in but only managed to find some fishing weights and a pair of binoculars, so if anyone finds a brick hammer and b&q chiesel, please pm me. Nick, would be nice to see your finds, sounds like you were looking towards Penarth if you had bone bed. Where abouts did you leave your hammer? Managed to pick up a couple more pieces of the plesi i'm collecting with another jumble of bones of which i can make out a piece of pelvis, a section of vert ,bits of rib and assorted unidentified bones.Apart from that we found nothing else of note not even a fishing weight. That is beautiful, well done. Partial fish palate with the crushing teeth in place - great find! Great finds love the fish plate. Another good day down lavernock. Also found the missing Hammer and Chisel, do i get a prize? that's them. Certainly deserves a prize in my book. That is a stonking fish spine Bow. Nice find! Crossing the eyes and dotting the teas. WOWZERS nice haul!! is the fin spine Hybodus? and the jaw lepidotes? Wow! Spectacular, love the fin spine. Sorry, its a nemacanthus monilifer spine. And I think lepidotes is the old name, its now sargodon tomicus? If I have these id's all wrong, please let me know. We are going to have to ban you from that beach you are doing too well,well done,we found nothing of any interest after leaving you.Let me know how you get on next week with those bits we told you about. Bow, very much looking forward to seeing the photo's. Rare stuff. Sounds great, can't wait to see pictures. Sorry all I have is this one photo taken on my mobile. The fossil has already been packed up and shipped off to get prepped. Theres some teeth scattered around, one was about 1cm long, the rest are about 0.4cm and are really thin. If you look closely at the piece with the X on it, there is a crack on it, a small is tooth just lying in front of it. Steve, it's back breaking work clearing that area, i did the whole strip from the one set of rocks to the other and found nothing lol.. At least that area is cleared of rocks/pebbles now. That's spectacular Bow! Looks like it could be fairly complete - can't wait to see it prepped. Spider, the sand clearing exercise is to do with something else (which i think i'm gonna give up on), the jaw was found in the middle of a large slab that fell out of the cliff at lavernock point, only the tip of the snout was showing on one edge, the rest was uncovered with a lucky blow with the hammer whilst trying to split the shale down to a decent size block. lovely find bow look forward to seeing it preped. Couple more finds from last week. This one is my fav, when it was found i thought i had 2 seperate bones, 1 vert and 1 phalange as only a small bit of the neural arch was showing, shows that i know nothing lol. Left to right, Bone from Ichthy pelvic region, Ichthy toothx2, fish tooth and pachy tail vert? Also found another rounded boulder that has 1 complete and 2 half verts strewn across the top and there are about 20 tiny ribs running through the bolder.